Posted April 23, 2014 by Michael Kelly, GIY Ireland in Features. Each month, I try and think about my seed sowing in two categories. The first category is those veg that we must sow pretty much every month to guarantee a consistent supply (without gluts)—so for example: lettuce, spinach, oriental greens, calabrese etc. Between March and August, I sow a little of these at the start of every month. 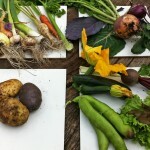 The second category consists of those vegetables that are sown once during the year, and in this category there are some really important ones to be sown this month. In early May, I sow my parsnips direct outside in the veg patch. Given how easy they are to grow and how well they stand in the soil over the winter months, I grow a lot of parsnips—enough at any rate to provide perhaps twenty parsnips a month between November and April (ie 120). That is a superb supply of winter food. In the potting shed early this month I will also sow my pumpkins, squashes, cucumber and sweetcorn in pots for later transplanting. 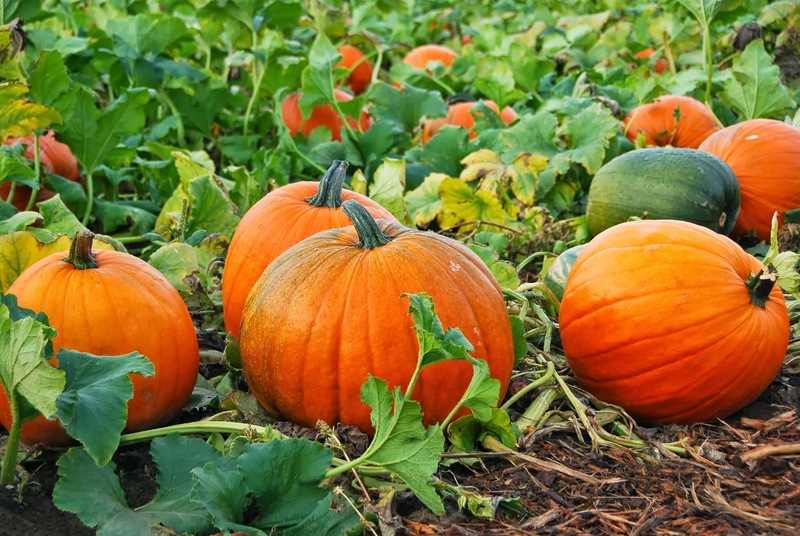 Pumpkin and squash are worth spending time on, given just how much food they can supply for the winter—last year, thanks to the brilliant summer weather, we had a bumper year for fruiting veg and I had about 40 squashes and pumpkins on top of the dresser in the kitchen. They are an invaluable ingredient for stews, soups and curries. Though they don’t store so well, cucumbers are also a productive veg—a single healthy plant will produce about 40 cucumbers over the summer months. Later in the month I will do a sowing of French and runner beans outside, while in the last week of the month I will sow my main crop carrots outside. Again, this is a crucial sowing. I aim to grow enough carrots to keep the kitchen supplied between October and next April—given that they are the quintessential stock-pot veg. We could easily go through 30–40 carrots a month, so ideally, I aim to grow about 250 carrots. If that sounds a lot, bear in mind you can grow 100 carrots in a 1 metre × 1 metre veg bed. May is the time to get those outdoor beds ready for early summer transplanting. Fork over and rake. Earth up potatoes as the plants develop. Put protective barrier around your carrots to thwart the dastardly carrot root fly. Regularly hoe weeds and mulch. Water plants if required. Support tomato, bean and pea plants with twiggy sticks, pea netting, timber supports with chicken wire, or existing fence or hedge. 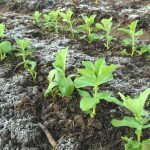 Pinch out the growing tips of broad beans plants to help prevent Blackfly. Indoors for planting on later: basil, dill, coriander, courgette, cucumber, sweet corn, pumpkins. Outdoors: winter cauliflower, cabbage, kale, spinach, sprouting broccoli, leeks, beans (French, Runner, Climbing French), beetroot, parsnip, turnip, swedes, radish, lettuce, peas, broccoli, rocket, carrots. Harden off and begin to plant out seedlings you have lovingly raised indoors—e.g. 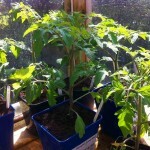 tomatoes, cucumber, peppers, brussels sprouts, sprouting broccoli, cabbages, sweet corn, leeks. May is another tricky gap month as stores continue to dwindle. Continue picking asparagus, purple sprouting broccoli, radish, rhubarb, cabbage, cauliflower, spinach and chard. May is likely to see the first real bumper salad leaves like lettuce and rocket—as well as the first garlic, beetroot and globe artichokes. I love the young tender stalks of rhubarb that you get early in the spring, but by now we are generally into glut territory, with larger stalks and lots of them! This recipe, from The Great Book of Rhubarb by Elaine Lemm, is actually better with larger stalks. This is very easy to make and yields about six jars. Bring all of the ingredients to the boil in a large stainless steel pan. Reduce the heat and let it plop away until thick and dark brown, stirring occasionally. Pour into clean sterilised jars, put lid on and store. Has a long store cupboard life. 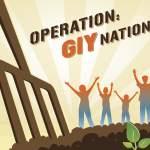 GIY is a not-for-profit organisation that aims to create a healthier, more sustainable world where people grow their own food. We inspire and support people to grow food more successfully by bringing them together to share advice, tips and ideas. There are approximately 50,000 people involved in the GIY movement in Ireland, which is proudly supported by Woodies DIY. For more information check out www.giyireland.com. This time of the year is all about managing the timing of when you plant seedlings out in the garden. Do it too early and the plants will be knocked back by night-time cold. Do it too late and the plants become pot-bound—that is, they have grown too large for their container resulting in tangling of the roots. I’m still too suspicious of the weather to plant out relatively tender plants like courgettes—by potting plants in to bigger pots, you buy yourself a couple of extra weeks where you can keep them in doors. I sow courgette, squash, cucumber and pumpkin plants in 5cm pots but they grow incredibly quickly and need to be put in to larger pots within two weeks or so. Simply pop the seedling out of its old pot, put a little compost in the base of a bigger pot, place the seedling in carefully and then fill it in with compost. It pays to water the plants very well about an hour before hand—the seedlings pop out of the pots much easier then—and of course you need to water again after you have finished potting them on.